Nickel is used as the positive electrode and cadmium as the negative electrode in nickel cadmium batteries, while the negative electrode is hydrogen absorbing alloy in nickel metal hydride batteries. The potassium hydroxide used as the electrolyte and the foam electrodes, enable high energy density as well as excellent charge/discharge and thermal characteristics in TEIG batteries. 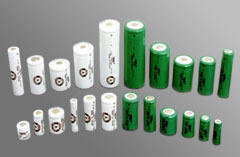 TEIG batteries have highly designed safe structure. The rigid stainless steel case has a high endurance to internal pressure and a resealable gas release vent is provided to guard against increased internal gas pressure generated be improper use of batteries. 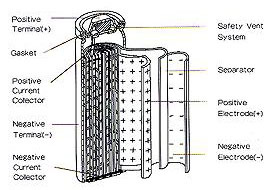 The following diagram shows the interior of a TEIG battery .